In this next article under the Corprorate Sustainability Series, Anuradha Bhavnani, Regional Director, Shell Foundation, talks about her views on the market based solutions approach of the foundation to tackle development challenges. Anuradha Bhavnani is currently the Regional Director at the Shell Foundation. She has worked with leading Global Multinationals across more than 12 countries. She is also an advisor to the Rockefeller Foundation on the Asian Climate Change and Resilience Program Network (ACCCRN) and a Chairperson on the Board of CottonConnect South Asia- a business with a social purpose: to work with retailers and brands to make the world’s cotton supply chains more sustainable. Shell Foundation’s focus areas are poverty, energy and environment. What is the focus on Shell Foundation’s work in India? What is the scale of projects being pursued in India? • Enhancing Access to Modern Energy Services for the poor in ways that are financially viable. We have learned a lot about trying to achieve scale and sustainability over the past decade. Scale means different things to different people. For us it is about delivering cost-effective solutions that impact large number of beneficiaries in multiple locations in ways that are ultimately financially viable and self sustaining . Now few of our partners in India- Envirofit, Husk Power systems, Embarq and Agrocel are well in stages of achieving scale within the country and we are hopeful others like CottonConnect and a few more will also soon get there. We are proud of their progress though we do believe we can still do more to enhance our overall performance and create more scalable and sustainable enterprises. We find it striking that in large instances where partnerships achieved scale and measurable impact, it has been with newly created entities that were using new business models that we had jointly developed. We do believe that Angel Philanthropy as a starting point of development change has significant potential to catalyze scalable solutions to global development challenges. For us Angel Philanthropy is about investing in a new venture without a proven track record or documented impact but with a new business based concept, a new product in a new market which has the intrinsic goal of going to scale, achieving measurable social impact and becoming financially viable. It is also hugely important to have an aligned vision with partners from the outset, with respect to achieving scale and sustainability. How important is it to incorporate principles of sustainable development into business? These principles are at the heart of the SF Enterprise based business model. There is clearly a need to deploy resources to build sustainable enterprises rather than simply provide grants to subsidize short term provision of a product or service. Building sustainable enterprises means investing in core capacity and systems as a pre-requisite for scale. It also requires additional input over and above grant finance in the form of business advice, market access and appropriate governance support. This means that large amounts of up-front subsidy as well as dedicated staff resources must be committed before verifiable developmental benefits start to materialize in the longer-term. Building sustainable enterprises that can effectively address development challenges takes time, patience and considerable investment . Testing new partners to provide new services in new markets will always be difficult and a high risk approach. It requires our staff to understand fully not only our partners’ business models but also the risks they face. Only then can we have the capacity to respond to changing circumstances and business challenges. Why according to you is there a need to create sustainable supply chains? Does it bring business benefit? Sustainability as a concept in any business, will need to add value and have a business case for switch. Our start was working with groups to build sustainable Livelihoods of a large numbers of marginal producers and farmers groups and use of toxic chemicals and fertilizers to grow products eg conventional cotton. Other areas are large amount of energy and water conservation, reduction in waste and a potential for creating large social and environmental impacts The future of supply chain management is sustainability. Forward thinking companies are already taking steps to develop sustainability within their supply chains. Of course there has to be a strong business case for such a change to be viable long term. Today businesses can see the need and also there is consumer pull in Global markets for ethical, fair trade, organic products and more sustainably sourced products. Consumers in many markets are ready to pay a premium for it too. Clearly businesses also build brand reputation and good will with their stakeholders by building sustainability into their supply chain. From an Indian context only a few businesses have ventured on this journey . The consumers too need awareness building. Shell Foundation has been working the area of sustainable cotton for more than eight years. Can you give us a little more detail on ‘Trading Up’? How does it help create sustainable supply chain? Would you be able to quantify its positive impact? Trading Up acts as a ‘bridging entity’ connecting major retailers with developing world producers and small businesses. It works to remove the barriers that often prevent such relationships developing. It does this by forming partnerships with retailers and providing producers with seed-capital, business mentoring and advice on product development and supply chain management. The programme is market-driven which means it provides major retailers with a tailor-made service that sources products they and their consumers want and takes the risk out of dealing with developing world producers. In July 2008, Marks & Spencer and Shell Foundation joined forces to make a bold statement to the retailers across the world: that it is possible to build sustainable supply chains that are genuinely good for business whilst simultaneously helping to eradicate poverty. 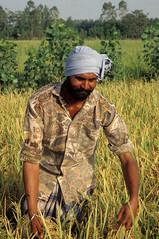 The Foundation helped Marks & Spencer to become the first major UK retailer to sell products from Fairtrade cotton – improving the livelihoods of more than 1500 Indian farmers – and to sell over one million bouquets of exotic South African flowers in their stores, creating 135 sustainable jobs and saving many thousands of hectares of biodiversity-rich land. Two years on, Shell Foundation remains an energetic champion for the creation of specialist ‘ethical agents’; entities capable of catalysing the win-win relationship between retailers and developing world producers. Only through the network expansion of such agents can industry significantly impact both economic growth and quality of life in low-income countries. Recognizing the need for distinct types of intermediaries for different markets, the Foundation has pioneered two models – one concentrating on small businesses selling niche agricultural and horticultural products, the other focusing on smallholder producers of commodity crops. Two new and independent global entities have been borne from this work. Pilots for a third model, a hybrid of the original two, for application in high value, complex agricultural product markets are showing similar promise. Small producers, commodity crops In 2008, the Foundation formed an alliance with Organic Exchange (a US-based NGO) and C&A (a major European retailer) aimed at improving the livelihood of 30,000 Indian farmers along C&A’s cotton supply chain – as well as their families, communities and the environment – by creating a significant growth in the demand for organic cotton. Sustainable cotton, such as organic and Fairtrade, can be produced without the intense use of costly pesticides and insecticides. This makes financial sense for farmers, but the associated health benefits for workers, lower water consumption and improved soil fertility mean that switching to sustainable farming methods improve livelihoods far beyond the farms themselves. With C&A providing the market demand, Organic Exchange delivering expertise on organic production and Shell Foundation bringing their experience of working with Marks & Spencer and Agrocel, the three partners worked with all the players in the C&A value chain – from farmers to ginners to spinners – to reduce poverty and protect the environment whilst creating a new range of organic products and further opportunities for the retailer to engage with its ethically-minded customers. farmers to make the world’s cotton supply chains more sustainable. The founding team at CottonConnect has been working together with the European brand C&A on their Sustainable Cotton programme since 2007, and has helped this business grow from 2.8mn garments in 2006 to exceed 28mn garments by the end of 2010. C&A are now the global number one retailer of Organic Cotton, working with over 21,500 farmers across both Organic and Sustainable Cotton in 2010. It will help retailers and brands to optimise their cotton supply strategies, and help stakeholders along the value chain to deliver the changes necessary on the ground – from farm to finished garment. Over time this will help set best practice within the wider cotton marketplace, allowing CottonConnect to promote the ethical agent model to cotton-producing countries beyond India. What has been the response of international retail brands to your initiative? How willing are they t o engage with the farmers directly without middlemen? The two brands that we have closely worked within India over the last few years are M&S and C&A. The role of the Ethical intermediary is set up as entities capable of catalysing the win-win relationship between retailers and developing world producer. Brands hence get a partner that provides the transparency and traceability and capacity build across the value chain and hence helps bridge the gap. The textile chain is complex and brands have never dealt with the groups on the ground. The Ethical intermediary is the perfect bridge for that role. How important is it to adopt a market based approach to enhancing sustainability? What are the drivers for an enterprise to invest in sustainable practices? We have found that a disciplined focus on financial returns and earned income is critical to ensure sustainability and an end to dependence on subsidies. This shared commitment to financial viability has enabled our strategic partners to leverage investment from other parties. What has been the learning with regards to finding sustainable and scalable solutions to global development challenges? Shell foundation has pioneered a new a successful enterprise base approach to tackle global development challenges. We believe that an enterprise based approach has relevance across all sectors when tackling market failures that typically are the prime cause of many global development challenges. Being enterprise based is about adopting a mindset and process of thinking rather than an expectation of delivering solely financial returns in a way typified by most commercial enterprises. • It takes more than money to build enterprises- large amount of time, patience and capital. We understand the start up risks, and have a team with business backgrounds. • Only a financially viable enterprise is sustainable. Financial viability means less reliance on aid. Also the growth benefits more people. How can foundations and social investors be more effective in scaling up sustainability solutions, specifically in the Indian context? - Focus on a few ‘big’ challenges. Very important to build scale that we focus all our resources to work on a few specific issues. - All partners require ‘more than money’ (e.g. business capacity / advisory). Just money alone will never build a success. - The Global development issues that many are trying to address are complex. To address such issues , you do need out of the box solutions, business model and the best business minds need to come together to get the solutions. - It needs more than a few small pioneers to resolve Global development challenges. Just a single pioneer achieving scale is a small dot in ocean – the need to fully address the needs of the un-served millions around the world. We now realise that achieving scale alone is not enough. - We do believe that more angel philanthropists are needed to catalyse and support the growing number of social entrepreneurs until they are ready to source second stage finance from others. We do believe opportunities exist for synergies and syndication between philanthropists and impact investors.